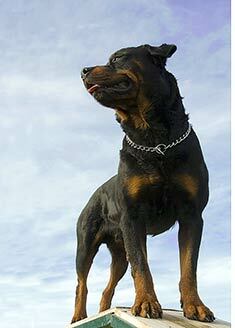 Rottweilers are a powerful dog breed with great strength, endurance and agility. An effective guard dog, Rottweilers are also dominant and pushy - and require constant training and firm, uncompromising rules. Although Rottweilers are a devoted and loyal dog breed, play around small children should be supervised. Male Rottweilers range from 24 inches to 27 inches. Female Rottweilers range from 22 inches to 25 inches. Male Rottweilers range from 85 to 135 pounds. Female Rottweilers range from 80 to 100 pounds. Rottweilers are typically black with well-defined tan or deep brown markings. Rottweilers have a medium length, dense coat. Relatively easy to maintain with some shedding, Rottweilers require brushing only once or twice a week. 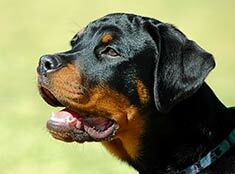 The Rottweiler is susceptible to bloat, parvo virus and hip dysplasia. It should be noted that the enormous popularity of Rottweilers has resulted in careless breeding. This has caused a number of crippling physical and psychological problems within the Rottweiler population. The expected life span of the Rottweiler is 8-11 years. Rottweilers need frequent exercise and daily mental challenges. Highly suspicious of strangers, Rottweilers should not be fenced in a place where people often walk by, such as next to a sidewalk or path. The Rottweiler is in the Working group. Find Rottweiler Puppies with our Free Breeder search!